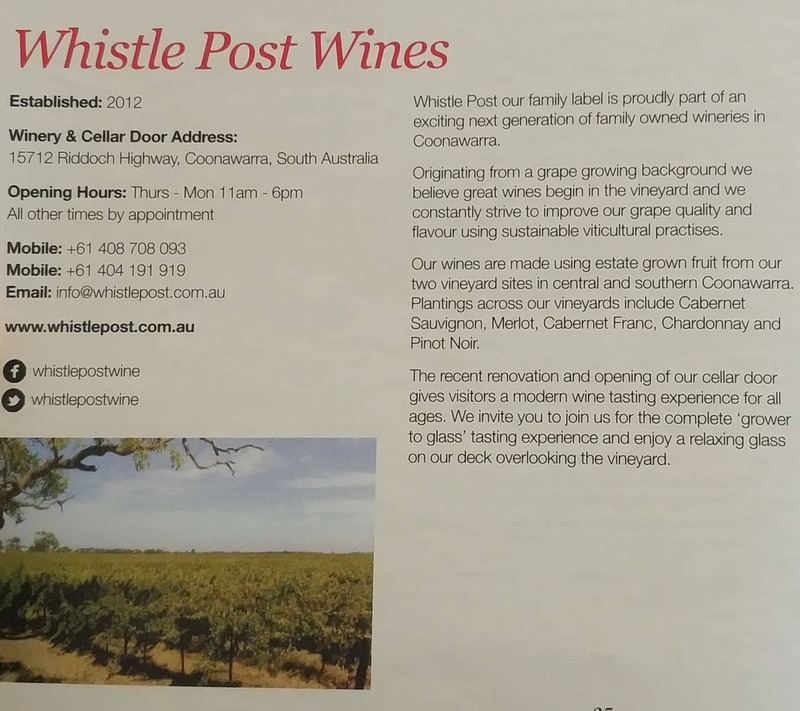 Whistle Post is a famous, award-winning winery located in Coonawarra. From its humble beginnings, the family-owned business has grown exponentially over the years, and has now become a leading wine producer in the region. The family has lived in the area for over than a century, which has equipped them with unsurpassed knowledge when it comes to growing anything local. In 2007, the family behind Whistle Post decided to shift from rearing cattle to producing wine. Wine production began in 2010, testing small batches to gauge its quality and taste. By 2012, the Whistle Post label was created and since then, it has grown to be one of the most well-loved wine brands in the region. The label was named after the railway, which played an important role in the wine region. Whistle Post wines are made using grapes grown in the vineyards located in both Southern and Central Coonawarra. This creates great variety in terms of wine character. Sample the 2012 Reserve Cabernet Sauvignon; a medium-bodied wine that features ripe plum and blackcurrant notes. For the seasoned wine connoisseur, it is easy to detect the traditional tannins that are unique to the Coonawarra wine region. The Estate Range on the other hand, includes the 2014 Cabernet Sauvignon, the 2017 Chardonnay, the 2015 Merlot, as well as the most recent, the 2017 Rose. The 2014 Cabernet has the delightful aroma of red fruits and blackcurrant, with a soft palate that features subtle flavours of light oak. Celebrate with the 2017 Chardonnay and enjoy its blended flavours of crème edges, and yellow citrus fruits. This Chardonnay is not stored in barrels, so you get to enjoy notes of lime and white peach. The 2017 Rose is a must-try when visiting Whistle Post. This premium wine is made using grapes sourced from the McCrae vineyard; it has the refreshing aroma of roseberries and rose petals, after which a palate of strawberries and rich cream follows. For the ultimate Whistle Post experience, visit the cellar door. Located on the popular Riddoch Highway, the cellar door offers wine tasting with a scenic view. The Whistle Post cellar door remains open from Thursday to Sunday, between 11am and 6pm. From Mount Gambier, once you reach the roundabout, continue straight ahead on Penola Road / Riddoch Highway / A66. Whistle Post Wines will be on your left.